Other kinds of art crafts include glass art, shippo (Japanese cloisonné), gem carving, inkstone carving, decorative metal cutting, and ivory carving. All of them have a long history and rich, distinctive traditions, and at the prestigious Japan Traditional Art Crafts Exhibition are exhibited in the category "Other Crafts." The raw material, silica sand, is placed in a high-temperature kiln and melted, then shaped and carved away to make designs. 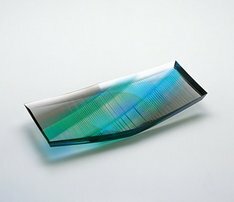 A glass-like glaze is applied in the spaces of a metal framework, and the piece is fired in a kiln. Japanese gem carving, known as gyoku, involves shaping naturally patterned agate or various hard crystals. Gold leaf is cut into delicate designs incorporating lines or squares, and fastened in place with adhesive. A raw stone is carved with a chisel into the form of an inkstone, and then polished with a whetstone and finished with wax or lacquer. Ivory, from elephant tusks, is carved into various forms such as animals, and dyed with plant-based dyes. Whetstones or diamond wheels of various shapes are attached to a rotating grinder and pressed against the outside of a glass vessel to create geometric design or curves. The finishing touches are put on the design with a fine whetstone, then it is polished and is complete. 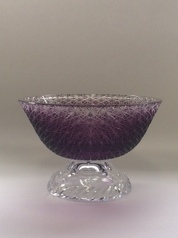 Famous styles include Edo kiriko and Satsuma kiriko. 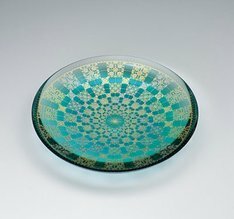 In this technique, abrading agent mixed from oil and sand is applied to the surface of a glass vessel to carve out designs, using a compact grinder with a copper plate attached. Glass can be freely shaped into various forms such as plants and animals. 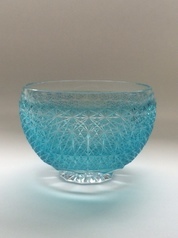 Enamel paint can be applied to the surface of a glass vessel to make a design. This is then fired at a low temperature of around 600 degrees Celsius in an electric furnace. When the enamel is fired, its surface takes on a beautiful sheen. Jade, agate, crystal and other hard precious stones are known as gems. These materials are carved to create objects such as tea bowls and incense containers. An inkstone is used for rubbing charcoal to create ink, which is used for writing characters with a brush in Japanese calligraphy. It is an extremely important stationery supply, as the process of rubbing the charcoal with the stone calms the mind before writing. To turn a rough stone into an inkstone, you carve it into its basic shape and then use a long-handled chisel to create the flat surface for rubbing the charcoal and the indentation where the ink collects. Lacquer or wax is applied to the finished product. Some of the most popular types of stone for making inkstones are amahata (slate) from Yamanashi Prefecture, akama (volcanic tuff) from Yamaguchi Prefecture, and horaiji (shale or slate) from Aichi Prefecture. This technique was originally used to create beautiful decorations for Buddhist statuary and so forth, but today it is used to create artworks such as decorative boxes. Decorative metal cutting begins with heating gold leaf as thin as paper in a charcoal fire and layering it to create thickness. The layered gold leaf is cut with a blade into fine patterns such as lines, squares and triangles. Then a brush is used to apply further gold leaf to the pattern, and the work is complete. Ivory comes from elephant tusks. During the Edo Period (1603-1868), ivory was a popular material for netsuke (a kind of decorative carved toggle on a cord) because of its ideal hardness, viscosity, and lovely sheen. In ivory carving, tusks about 15 centimeters in diameter are cut into shapes using chisels and files. A small blade is used to smooth the bumps on the surface, and it is further burnished with polishing powder or powdered deer horn. The carved ivory may then be dyed with blue or red dye and designs made with fine lines in the technique known as bachiru, which dates back to the Nara Period (710-794) and has been revived in modern times. "What Are Traditional Crafts? 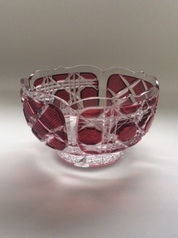 -A Guidebook to Seeing, Learning, and Enjoying-"
Edo Kiriko, cut glass ware, is produced and sold throughout the Tokyo region; they are characterized by the sparkling prismatic light created by skilled and exquisite cutting.